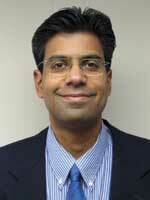 Umesh Parashar leads the CDC Division of Viral Diseases Enteric Viruses Epidemiology Team. He is the co-lead of the Advisory Committee on Immunization Practices Working Group, which developed recommendations for rotavirus vaccine use in the US. Dr. Parashar and the CDC Enteric Viruses Team were responsible for disease burden and surveillance activities for the Rotavirus Vaccine Program (RVP) a partnership between the CDC, WHO and PATH, supported by GAVI. From 2003-2009, RVP worked to accelerate the introduction of rotavirus vaccines in developing countries with the greatest rotavirus disease burdens. Dr. Parashar has spent more than 15 years at the CDC researching the epidemiology of viral gastroenteritis and methods for its prevention and control. His research has included the development of rotavirus vaccination strategies. Dr. Parashar first joined the CDC as an epidemic intelligence service officer in 1996. He has published more than 170 scientific papers and book chapters and has given numerous presentations at scientific conferences. He also served as a guest editor of four supplements for leading scientific journals and on WHO advisory committees. Dr. Parashar attended medical school in India and completed his postgraduate training in public health and preventative medicine in the United States. He holds an MD and MBBS.